Figure 1. An artist's view of the experimental apparatus: Electrons (blue arrow) passing through a quantum conductor under (center) a bias voltage. The current fluctuates due to the randomness of the transport and generates photons (red squiggly arrows) inside the coaxial cables. The photon population fluctuations N(ν) in one detection branch is then cross-correlated to that in the other branch; therefore, recreating the Hanbury-Brown Twiss interferometer configuration. A conductor in equilibrium under a bias voltage shows current fluctuations proportional to its resistance and temperature. This type of noise is known as the Johnson-Nyquist noise, or equivalently, the thermal noise. In a quantum conductor, current fluctuations generate microwave photons which obey chaotic statistics (cf., blackbody radiation) if the conductor is at equilibrium. When the conductor is out-of-equilibrium; however, the stochastic aspect of the electron transport gives rise to different kinds of current fluctuations (quantum shot noise) that muddle the photon statistics. Understanding the link between the statistics of electrons and that of emitted photons is very intriguing as it will reveal the connection between quantum conductors and quantum optics. This problem has recently attracted theoretical interest, and a full spectrum of photon statistics, ranging from chaotic to non-classical, has been predicted . 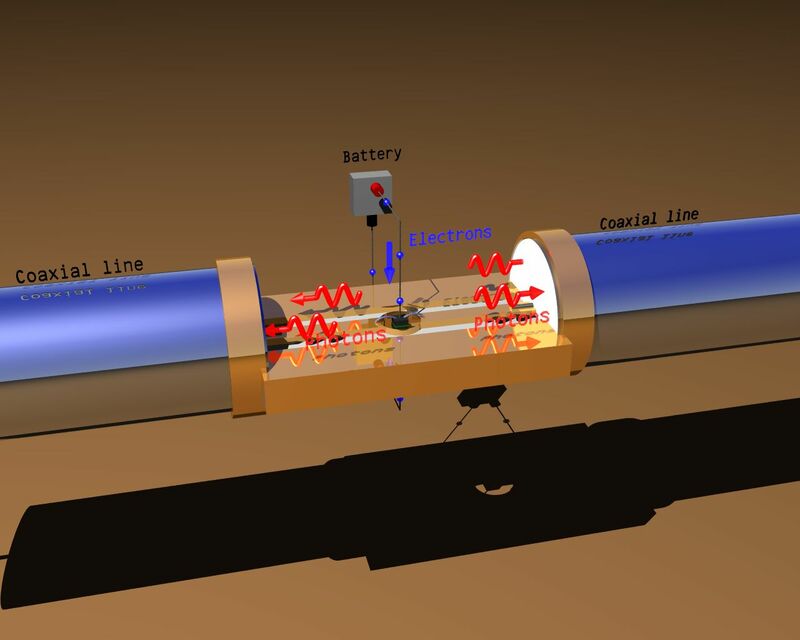 Recently, the Nanoelectronics group at SPEC has performed the first experiments to put theories on test by measuring the statistics of microwave photons radiated by a simplest quantum conductor; a tunnel junction, in the shot-noise regime. To investigate photon correlations (and thus, their statistics), they have used the Hanbury Brown-Twiss interferometer technique (see figure 1), a method used by astronomers to study stellar sizes over a half century ago. They find that the photons emitted by the tunnel junction exhibit chaotic statistics, even when the emission rate is down to the order of unity. Their results are found in perfect agreement with the theoretical predictions by Beenakker and Schomerus (see figure 2). 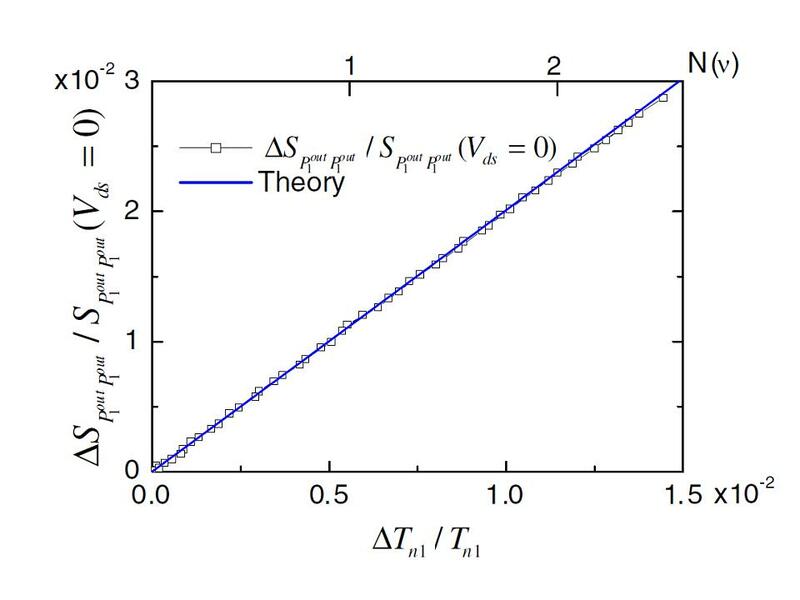 This work paves a new passage to study the statistical properties of photons emitted by mesoscopic conductors where electronic correlations may have a stronger impact, such as quantum point contacts. These findings are reported in the May 21st issue of Physical Review Letters ("Experimental Determination of the Statistics of Photons Emitted by a Tunnel Junction" by Eva Zakka-Bajjani et al. volume 104, 206802, ). The article has been selected as an "Editor's suggestion" and has also been covered by Synopsis in Physics.